Steam is a great application for video gamers to have video streaming, multi-player gaming, groups and chat facilities. Many gamers use this application extensively due to the advantages it offers. While using Steam in SSD’s, some users complain about a common error called ‘Disk write error’. It usually occurs when you are installing or updating a game in Steam. To resolve this error, we provide you with some troubleshooting steps here in this article. Most of these steps are simple and only involve minor tweaks within the Steam settings. Simply changing the download location will help you resolve the issue in some cases. To change the location, you can follow the steps below. If changing the download location doesn’t work, you can try clearing download cache within Settings. At times, even if you have not intentionally changed the library folder, it may have undergone changes. So you can try to resolve ‘Disk write error’ by repairing the library folder. If the above methods don’t help, there are chances that your Steam installation files are corrupted. In such cases, you can repair these files using the built-in repair feature. This will repair any corruption in the Steam installation file and help you resolve the ‘disk write error’. Using ‘flushconfig’ command resets the Steam configuration and all settings will be set to default. 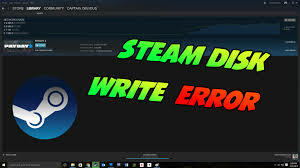 Errors such as Disk write error’ are common on Steam games installed on SSD’s and can usually be resolved using simple troubleshooting steps as discussed above. But if these methods don’t work, you can check if your antivirus is the one causing trouble. Disable antivirus temporarily and update your game. If this doesn’t help, check your hard disk for any potential errors or corruption. In such cases, repairing your hard disk might do the trick. How to Solve ‘This Product Needs to Be Installed on Your Internal Hard Drive’ Error?